I finished. All 622 mountainous miles ... with 13 minutes to spare. Don't really have words to describe the range of emotions and sensations experienced in this 74-hour 47-minute ordeal. But among them is a sense of relief that Paris-Brest-Paris may actually be feasible next year. Prior to this ride, I failed to write about my previous two significant brevets. Before last month, I documented every randonneuring event I've ridden since the Desert Rivers 600k back in September, 2008 (which has meant a report at least every month since then). But recently, I’ve been so involved with moving, housewarming, continued unpacking, and busy-ness at work that blogging has taken a back seat. But in this report, I'll play catch up, by dedicating a paragraph each to the previous two brevets. Eden's Gate 400k on May 1st was a pleasant if not headwindy tour of the Willamette Valley and several of its covered bridges. It started and ended in Wilsonville. Initially, I had plans of significantly improving my time for this awkward distance. As it turns out, I did set a PR, but simultaneously "lanterne rouged" it (with three others) as well. I was doing okay mid-ride (which means while not setting any self-powered land speed records, I was still tracking for a decent time), leapfrogging some with Dan Jensen and his friend Richard Hornung. I then joined a pretty good paceline near the southern-most point (around Coburn), but then flatted. In Harrisburg, I caught up with Dan, Richard, and Amy Pieper. We had some pretty good pacelines heading up into Albany (with Dan doing most of the pulling). After Albany, Amy's stamina began to falter, and we slowed down momentarily to walking speed to recover. Around Salem, we were passed by other groups of riders, but by then our quartet had formed enough camaraderie that it seemed best to ride with them to the end. We finished what Amy called “the most difficult easy 400k she’s ever done” with a time of 23:28. The Oregon Coast 600k on May 22-23 was really nice (if not hillier than expected), at least the 2/3 of it I did. The main pack pulled away fairly quickly not far from the start in Forest Grove. Nevertheless, I felt like my pace was pretty good through Birkenfield and Warrentown. When I flatted (twice!) near Ft. Stevens State Park, I was a little surprised how quickly Roger and Ali (from BC) and Narayan caught me. My flat-changing skills still not being up to snuff, I was quickly put in the position of fighting the clock. And in case you're wondering, Highway 101 between Seaside and Lincoln City isn’t flat. By the time I got to the overnight contrôle (at 6:00 AM), my average speed had decreased to the point where I had no time in the bank. Nevertheless, I continued along the attractive Siletz River to Logsdon. But because I was continuing to lose time, and with a significant hill in the distance, I decided to call it quits. Then while continuing at a very slow meander, organizer Joshua Bryant drove past (directly witnessing my disappointment). As soon as he got a cell phone signal, he called my friend Amy to pick me up in Blodgett. The disappointment of dnf’ing lasted a few days. But in retrospect, maybe it wasn’t all bad. Maybe the conserved energy helped three weeks later with the OBM1000k. June 12th seemed to arrive rather quickly, so much so that I didn’t obsess much about the upcoming Oregon Blue Mountains 1000k. I had pre-registered in early Spring, and had for quite some time established it as my main goal for the 2010 season. But it wasn’t like I spent a lot of time analyzing the route and becoming familiar with the details. Sure, I printed out the 36,000-ft net gain elevation profile, but those lines don’t mean the same thing on paper as they do when you’re on the bike. The day before embarking on this potential 75-hour adventure, I took the LeMond into my LBS for a final once over. Lo and behold, when refilling the rear tire with air, the rim blew! (The walls of the rim had become excessively thin from a lot of braking.) So, I embarked on this particular rando journey with a hastily borrowed (and noisy) rear wheel from the Beaverton Bike N Hike. Hey … it worked! 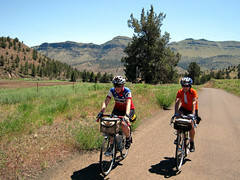 My friend Amy drove me out to The Dalles on Saturday morning, getting us there within a half hour of the start. Once the ride was underway, most of the riders hung together through The Dalles, but began to separate on the Hwy 197 bridge over the River Columbia. Eastbound Highway 14 out towards Umatilla didn’t have the favorable tailwinds that swiftly pushed the riders of the Desert Rivers 600k 21 months earlier. Nonetheless, the first 200 kilometers were mostly free of the hills that defined the remaining 800k. I intermittently rode with a couple other riders during the course of the 3-plus-day brevet, but hop-scotched Peg Winczewski and Lesli Larson for almost the entire event. The two of them tended to climb a little faster than me, but they also tended to take slightly longer food breaks at the contrôles. What was most remarkable about them, though, was their unflappable steadiness despite never accumulating a lot of time in the bank. If they were ever concerned about not finishing in time, I would have certainly never guessed it. 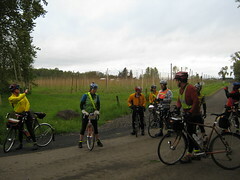 The first major climb was Eastwards on Hwy 204 out of Weston, and lasted about 30k (19 miles) to the summit in Tollgate. Prior to this climb, Peg, Lesli and I had stopped for dinner at a café in Athena. I arrived and left there a little before the two of them, assuming they would catch me on the long ascent. While the sun was setting (and afterwards) during the climb, I would occasionally hear Peg’s and Lesli’s voices approaching from behind. But surprisingly, I arrived at the contrôle at the top before them. There at the Tamarack Inn volunteers served warm soup and made-to-order sandwiches before sending us out on a long dark 35k (22-mile) descent to Elgin. The next contrôle was 33k (20 miles) after Elgin on the outskirts of La Grande. What was remarkable about this major Eastern Oregon town was the amount of major pre-dawn freight train activity. I must have waited for or ridden along 3 different 100-plus-railcar trains in my brief stint there. Dawn and a very beautiful sunrise occurred in the rolling hills between the contrôle in Union and “overnight” stop in North Powder. After a few pieces of pizza at the North Powder Motel, Paul Whitney steered me to a room for a 90-minute nap. By the time I was up and about, there were Peg and Lesli again, having breakfast. Jim Hinkley passed me going South on Hwy 30 to Baker City. I drafted him a little bit, but that was short-lived. Baker City was hosting a rather large Harley-Davidson convention during the weekend. In fact, every motorcyclist in Eastern Oregon appeared to be out on the road on this particularly bright and dry Sunday afternoon. 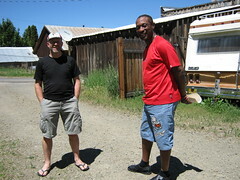 The next series of serious hills happened on the Sumpter State Hwy between Baker City and Prairie City. John Kramer marked the elevations of the summits on his route sheet (5118 ft, 5117 ft, 5268 ft), so I had some “fun” (as it were) with knowing how much vertical ascent I had left on any particular climb (with help from Garmin’s altimeter function). Between the 2nd and 3rd passes was a contrôle at the Austin House, where Alan Woods was departing at about the same time Lesli and Peg settled down for a proper meal. I purchased only a milkshake, and after pouring much of it in one of my water bottles, headed to the 3rd summit (this one on Hwy 26), then Prairie City. I missed Logan Valley Road out of Prairie City, and instead took an extension of what was marked as Bridge St. (which zigzags out of town, and which I understood “ran into” Logan Valley Rd.). This unfortunately cost me an extra 11 kilometers. But it cost Alan Woods a lot more, who independently made the same wrong turn 20+ minutes earlier. Alan was understandably perturbed. I was thankful, though, that he saved me from further bonus miles. With somewhat diminished enthusiasm, the two of us rode together 15 miles up to Trout Farm, a nice little campground with fresh water and the cleanest non-porta-potties I have ever seen. While doing a wardrobe change, Lesli and Peg caught up with us. The four of us then continued together to the next summit (5,950 ft) and onward an additonal 15 miles to the contrôle at Parish Cabin Campground. Well, actually, I lost Alan, Peg, and Lesli about a dozen miles shy of the campground, their taillights disappearing into the distance. This section of the journey was unexpectedly difficult, and was where I came closest in the whole 3+ days to abandoning. My bike suddenly felt very ill-fitted (I’ve had the fitting on my LeMond fine-tuned three times! ), and I ended up walking up a couple of the rollers on the way to the campground. I finally got there with 5 minutes before the contrôle was scheduled to close, about 15 minutes behind Alan, Peg, and Lesli. There I plopped down next to a campfire and was fed a warm cup-o’-noodles and 1 ½ sandwiches. Alan thankfully had some ibuprofen that he shared with me, so that when we finally left, I was relatively good to go. Alan was anxious to get going (a little more so than Lesli and Peg), but he was also concerned about my safety. He accompanied me during the entire 28-mile descent to John Day, during which we were able to make up considerable time (despite the darkness and the cattleguards). Once on Highway 26 (heading westwards), Alan took off at his own pace, and was napping in Scott Peterson’s van at the Dayville contrôle when I arrived. Once Alan left, I took over his space in the van. Peg and Lesli arrived a little later, and took naps in the pleasantly heated park restroom. Thirty-eight miles later (after the scenic river-hugging John Day fossil beds) was the 2nd “overnight” contrôle … in Mitchell. But in that 38 miles was another summit that took me forever to climb. Peg and Lesli passed me while I stopped to remove some layers of clothing, and I never saw them again (until Mitchell). Once I arrived, the place was swarming with attendant volunteers (including speedy Kole Kanter, who obviously I’d heard of before, but had never met). The rooms in the Oregon Hotel in Mitchell are quite charming, and warrant a future visit … longer than the 90-minute nap that Vincent Muoneke woke me from. Fueled and somewhat rested, I headed northwards towards scenic Girds Creek Rd. Lesli and Peg once again passed me during the ascent, and I passed them on the descent to the John Day River. Once on Rowe Creek Rd, they again passed me, and I would not see them again till Fossil. In the meantime, there was significantly more climbing, and a few miles of chip seal to deal with (problematic only during the descending portion). 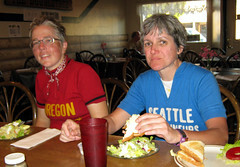 Once in Fossil, Peg and Lesli were finishing lunch at a charming local café when I arrived. Rather than shorten my stay in order to hang on with them, I elected to have a proper sit-down burger. The benefit was I got relatively well-fueled. The downside was I’d be riding solo (as lanterne rouge) all the way to Antelope. Six miles out of Fossil was the next summit (3,710 ft), up to which I steadily churned, followed by a long descent to the John Day River (again), this time at Clarno. The actual final approach to that river crossing was uphill, and happened during blinding sunset. On the far side of the bridge waited roving Paul “Dr. Codfish” Johnson, who had been busily offering valuable impromptu aid and encouragement to all the riders throughout the entire event. This crossing of the John Day River was perhaps my most pivotal moment in the whole 1000k, as the next contrôle (in Antelope) was 15 miles away, the first 8 of those miles being literally straight uphill. Paul’s advice was to keep pedaling. 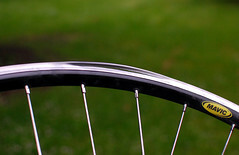 My solution was to lessen the pressure on my handlebars (push on them rather than pull, thereby lessening the tension in my shoulders), and to find a cadence that I could steadily maintain for two hours. It meant not letting up for 120 minutes of ascent at a 4 mph pace. I didn’t even stop to turn on my lights until the summit, but rather switched on the helmet-mounted lights while pedaling. My legs (and palms) got sore during the last two miles, but I finally made it. After adding layers of clothing and reflective gear at the top, I descended into Antelope, where I found Dr. Codfish, Dave Read, Peg, Lesli, and some more warm soup! From Antelope, I rode with Lesli and Peg to Shaniko, then to Bakeoven Road. On that infamous stretch of road, I fell behind the two of them, needing to eat something and rest. When I got going again, it wasn’t in a very determined way. In fact, what transpired was one of the most surreal and hallucinogenic experiences I’ve ever encountered on a bicycle. I had no way of telling where I was. For all I knew, I could have been in the middle of the Florida Keys surrounded by water … on some canopy-covered roadway. My headlights were playing tricks on me. I felt like I was operating a pedal-powered delivery cart, and I kept getting off the machine (my bike) every five minutes to make sure the road was still passable. How I kept going, I don’t know. The last thing on my mind was the brevet card in my back jersey pocket that needed to get signed in a place called Maupin. Eventually (after a cold bit of eternity) Bakeoven Road turned and descended into Maupin, whereupon some energy and lucidity returned to my body. For some reason, though, I was expecting signage directing me to the contrôle, and didn’t realize how far I needed to ascend the other side of river to find it. So I wasted several trips back and forth over the bridge before I gave up, taking a picture of the Maupin City Park sign to prove my existence there. I called Dave Read with the intention of letting him know where I was (wasting more time looking for a cell signal), when he told me the contrôle was further up the road. When I finally found it, Ian Shopland and Alan Woods were leaving. Peg and Lesli would leave a few minutes later, and Dr. Codfish (who seemed very happy to see me) tried to get me to leave as soon as possible. But it wasn’t gonna happen until I downed a warm cup-o’-noodles. The order in which the five of us departed Maupin would determine the order in which we finished in The Dalles 46 ½ miles later. The headwinds on the grade out of Maupin were worrisome, but The Dalles-California Hwy (US 197) finally flattened out into the Tygh Valley. Then the last big challenge, a 6-or-7-mile climb to Tygh Ridge, appeared as a swoopy ascending multi-lane asphalt ribbon with no immediate end in sight. I started to get woozy on the bike ‘round then, and quickly ingested a 2-ounce bottle of “5-hour Energy” that Dr. Codfish had given me way back around Clarno. That foul “sugar free – Only 4 calories” substance seemed to do the trick as I re-started pedaling up the grade. In fact, I actually spun pretty freely, and even managed to stand up in the pedals and mash it a few times (which I thought was remarkable after 71 hours). The Eightmile Road turnoff from Hwy 197 occurred much later than I anticipated, though. Supplemental batteries weren’t recharging my Garmin properly (so it was turned off), and my Cateye Strada was set to the metric system. Basic math had become challenging at this point in the ride, and I was considerably worried that I had missed the “Easy to Miss!” turnoff. I even stopped to ask a couple highway workers where Eightmile Road was, and was quite surprised when they said 6 or 7 miles further. 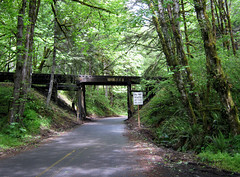 Rural Eightmile Road is an exquisite way to approach The Dalles at the end of a journey such as this. And even with headwinds, I was no longer worried (short of a mechanical) of finishing in time. At the last contrôle (junction with Fifteenmile Road), I stopped to call Amy to see if she had the time and would be willing to drive out to The Dalles to pick me up. Turns out she was already in The Dalles, breakfasting at Dennys, and watching the previous four riders come in. I took it easy for the last five miles, even keeping an eye out for a store from which I could purchase a little symbolic red light bulb. No such luck, though. As I finally turned into Motel 6 parking lot, it was moving to see John Kramer, Dave Read, and “Dr. Codfish” so happy to see me. Mark Thomas (a three time PBP veteran) told me afterwards in the motel room that this was harder than Paris-Brest-Paris. I think that’s encouraging, although I’ve decided that any ride in this league will be considerably more enjoyable if I can gain some more speed, thereby enabling longer naps. This ride was memorable; I still get emotional just writing about it. It was also quite a feat of organization. Many thanks go out to John Kramer (who told me he probably drove the entire length of the route three times in preparation), Dave Read (who coordinated a terrific crew of volunteers), and Paul “Dr. Codfish” Johnson (whose timely acts of encouragement were invaluable). And while this ain’t the Academy Awards, I also want to thank Alan Woods for his Advil, his company from Parish Cabin to John Day, and his saving me from additional bonus miles outside Prairie City. I also want to acknowledge the steadfast cheerfulness of hopscotch partners Lesli Larson and Peg Winczewski. Thanks also go to coach Brian Abers for believing I could do this, even after DNF’ing the 600k three weeks earlier. And finally, to Amy for getting me out to The Dalles and back (thereby allowing me extra sleep in each direction!). The rest of my pictures are here on Flickr. Kramer has links to many other reports and pictures here on his blog.